I am updating my website to reflect changes in record availability and, let me tell you, with Chicago research, knowing what's what is NEVER easy. 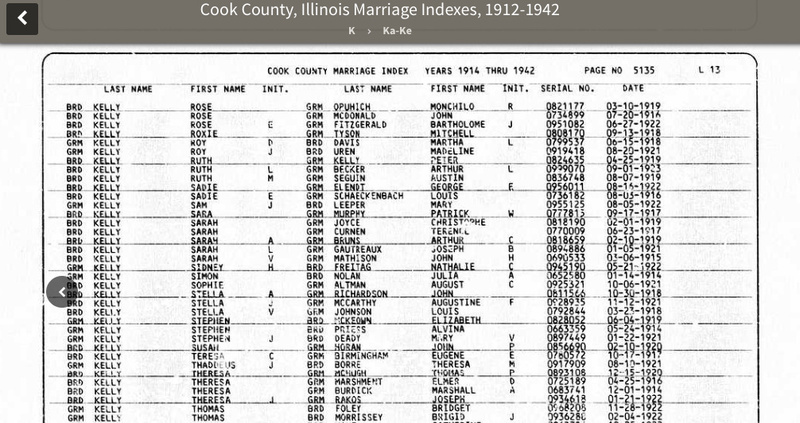 Ancestry offers a database titled Cook County, Illinois Marriage Indexes, 1912-1942. I did a quick study, searching for exact years from 1912-1925, and noted the number of matches below. It's likely this index only covers 1914-1923 in a reliable way. Some of the outlying entries may be correct. I find Thomas Kelly and Geneveve Carter listed in this index and in FamilySearch's Illinois, Cook County Marriages, 1871-1920 with the same year (1913) and license number. But some are due to error. Max Stone and Mabel Freed come up under 1912, but the printed index page that's linked from the index entry says 1917 and it's corroborated by the FamilySearch index. The fiche was scratched, making the date hard to read. 1) If you're searching for a record through1920, use the FamilySearch index linked above. 2) If you're going to use this index to search for records outside of the 1914-1923 range, be cautious not to jump to the wrong conclusion if no matching entry can be found. I'll try to address indexes for 1925 forward in another post. Have a Horrible Copy of a Chicago Vital Record from Microfilm? Try Again Online! Back in the day, before many Chicago vital records were made available in digital format on FamilySearch), I retrieved hundreds--maybe even thousands--of Chicago birth, marriage, and death records from microfilm. Here's one of the records I printed long ago. I was really good at tweaking the settings and, I promise you, this is absolutely the best I could do. Chicago, Cook County, Illinois, death certificate no. 17017 (21 March 1908), Charles B. Smith; FHL microfilm 1239777; Wilmette Family History Center, Wilmette, Illinois. Chicago, Cook County, Illinois, death certificate no. 17087 (21 March 1908), Charles B. Smith; digital image, "Chicago death certificates, 1878-1915," FamilySearch (https://www.familysearch.org/search/catalog/42925 : accessed 12 March 2019) > microfilm 1239777, digital folder 4004622 > image 841. 1) The online certificate image was created from the original, not from the microfilm. I talked with the FamilySearch folks who were digitizing records in the Cook County Clerk's office some years back and I remember them telling me they were working with some records that had already been microfilmed. 2) Just because a film number appears in the FamilySearch index entry doesn't mean the published image came from the film. 3) This is probably something that's unique to Chicago records and very few others. 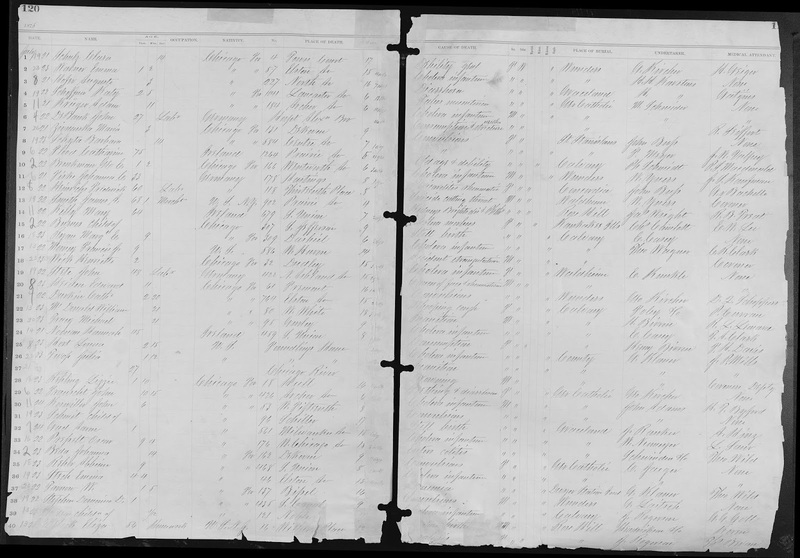 So, for what it's worth, if, by chance, you have a hard-to-read printout or digital image that was made from FamilySearch microfilm, it might be worth checking online to see if you can now get a better copy. I woke up thinking it would be a good day to work on updating chicagogenealogy.com. I ate a pink-frosting-covered sugar cookie that I got on sale at the grocery store yesterday, went to work on the tutorial page for finding death records, and was like, "Wow. Wow! WOW!" 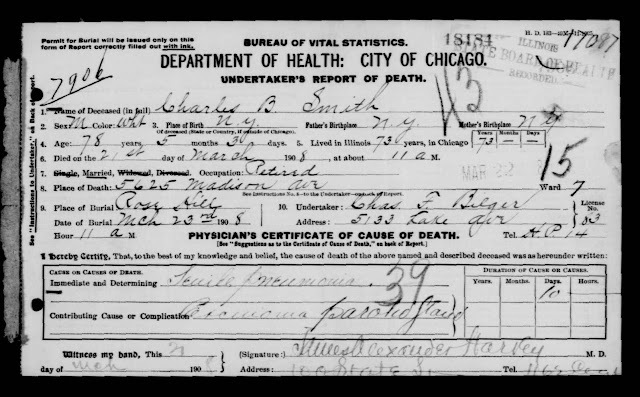 I don't know when it happened, and maybe this is old news, but Chicago death registers, 8 October 1871 to 29 February 1879, are now available for viewing on FamilySearch under the title Illinois, Cook County, Chicago, death registers, 1871-1879. For years, I've been saying "they must have death registers" but I'd never seen one. I'd just seen evidence of their existence. Remember the Indexes to deaths in the city of Chicago during the years 1871 to 1933 : showing name, address and date of death? Here’s the index entry for James A. Smith who died in 1875. The “D” refers to a death register, the “120” is the page number, and the “13” is the line number. > digital folder 4261177 > image 263, entry for James A. Smith, 1875. 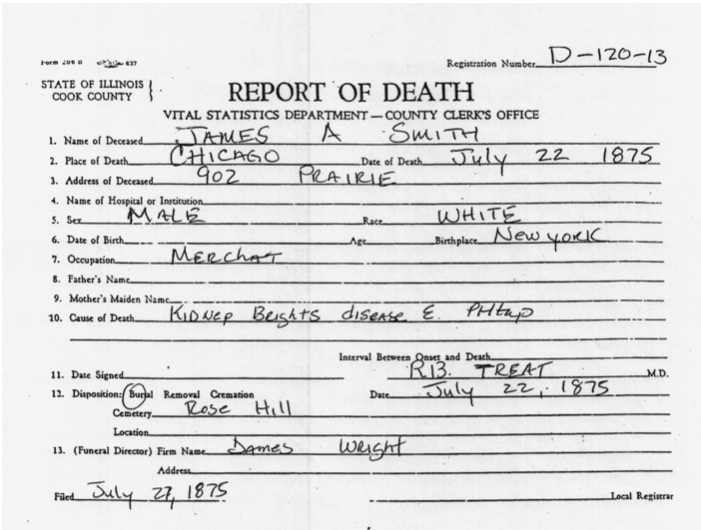 Chicago, Cook County, Illinois, death registration no. D-120-13 (1875), James A. Smith; Cook County Clerk’s Office, Chicago. It was great to have the information but it was clearly a derivative record. I knew it had to have been copied from a death register–that was the only logical explanation–and I longed to see the record the information was copied from. Well, this morning, that dream came true. I discovered the record images are now online and knowing that I could only access them from a Family History Center or an affiliate library, I took a quick shower, dropped my husband at work, and headed to the Orange County FamilySearch Library. Chicago, Cook County, Illinois, “Deaths 4, Jan. 1, 1875 to May 31, 1876,” p. 120, line 13, James A. Smith (1875); digital image, FamilySearch (https://www.familysearch.org/ark:/61903/3:1:3Q9M-CSYX-R311-K?i=122&cat=3157227 : accessed 7 March 2019). I believe this is actually a derivative record, too–it was likely created by copying information from certificates into the book as that’s the way the Chicago birth registers were created–but it’s one generation closer to the original. And why is this so exciting? Because it means researchers can now access information about early post-Fire Chicago deaths without needing to rely on the Clerk’s office for help. If you can’t get to a Family History Center to access the index and the register pages, I can search for you. Just send me a project request through my profile on Genlighten.com. And, please post a comment to let me know if this post was of help to you in your research. I'd love to hear from you. In my last post, Visualizing Birth Evidence, I used date ranges calculated from an age on a particular date. It took me a long time to wrap my mind around this but now that I understand how it works, I find it much more useful than just subtracting an age from a year and it isn't that much harder to do. So, if 2 July 1885 happened to be Frank's birthday, he would have been born on 2 July 1837. And, in fact, if he had been born any time between 1 January 1837 and 2 July 1837, he would have already turn 48 by 2 July 1885. But what if he happened to have been born in the second half of the year? If he was 48 on July 2, looking forward to celebrating his 49th birthday between 3 July 1885 and 31 December 1885, that would mean he was born in 1836. So, the birth date range for Frank, who was 48 on 2 July 1885 is 3 July 1836 to 2 July 1837. When Frank registered to vote on 16 October 1888, he stated that he had been in the city of Chicago for 52 years. He was born there, so, theoretically, that would have been his age. 1888 minus 52 equals 1836. So, the date range for Frank's birth calculates to 17 October 1835 to 16 October 1836. Now let's look at these two date ranges together. 1) The approach is only as good as the information it's based on. 2) Date ranges are particularly useful for comparing age information from records that were created in different months. 3) When calculating date ranges from census records, the census dates vary, depending on the census year. (For a quick reminder, just Google "u s census dates.") Also, census takers might have recorded ages as of the census date or as of the date they visited--no matter what the instructions asked them to do. And where can we find age information for particular dates in Chicago records? What have I forgotten? Leave a note in the comment section to let us know! Subtract the age from the particular year to get the end year. The end year is the same as the particular day. Subtract 1 from the end year to get the start year. The start day is the day after the particular day. 1. Cook County, Illinois, probate file no. 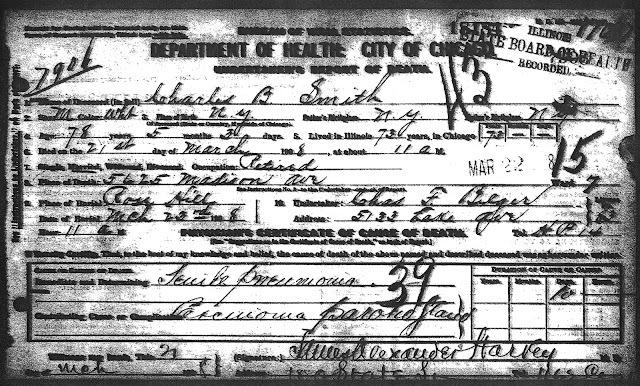 4-2790 (1885), Marcia M. Smith, proof of heirship, 2 July 1885; Cook County Circuit Court Archives, Chicago. 2. "Chicago, Illinois, Voter Registration, 1888," database with images, Ancestry (https://search.ancestry.com/search/db.aspx?dbid=5991 : accessed 5 November 2018), entry for Frank M. Smith born in Illinois. 3. American Ancestry: Giving the Name and Descent, in the Male Line, of Americans Whose Ancestors Settled in the United States Previous to the Declaration of Independence, A. D. 1776, Vol. IX (Albany, N.Y.: Joel Munsell’s Sons, 1894), 132; digital image, Google Books (https://books.google.com/books?id=7Ew7AQAAIAAJ : accessed 5 November 2018). So, prompted by some work I've been doing on trying to figure out birth, marriage, and death dates for a number of my husband's Chicago relatives, I've come up with a way to visually compare the evidence. It isn't a ground breaking approach--I'm sure a lot of you do something similar--but it's pretty simple and I'm finding it really helpful so I thought I'd share. 1894 American Ancestry: Giving the Name and Descent, in the Male Line, of Americans Whose Ancestors Settled in the United States Previous to the Declaration of Independence, A. D. 1776, Vol. IX (Albany, N.Y.: Joel Munsell’s Sons, 1894), 132; digital image, Google Books (https://books.google.com/books?id=7Ew7AQAAIAAJ : accessed 5 November 2018). "Francis Marion Smith, born in Chicago, Sep 27, 1836"
1899 "Frank Smith Passes Away," The Chicago Tribune, 14 October 1899, p. 7, col. 1; digital image, Newspapers.com (https://www.newspapers.com/image/349269502/ : accessed 9 April 2018). Born in Chicago in 1836. But, as you can see, even though the evidence is neatly summarized in one place, it's still hard to grasp what's what. Here's where a visual summary like the one below comes in. Basically, it's a table that allows me to plot dates or calculated date ranges from the sources listed in the evidence table. It took a bit of tweaking to set up the template, but now that I have it, it's pretty quick and easy to fill it in. Sometimes I use color, but this one happens to be grayscale. In this case, it shows, at a glance, that the exact date published in the family history falls into the ranges suggested by information from every other source collected to date. It also shows, by way of the shading, which sources should be the most reliable. Frank was the informant for his age on the proof of heirship record and for his length of residence on the voter registration record (which should have been his age because he was born in Chicago) so I've colored those squares darker than the records that have unknown informants. The parents probably married in 1828, but one source suggests 1829 and it can't be completely ruled out, thus the two entries in yellow/orange. The brother's birth month and year, shown in green, is very likely correct. His death at sixteen months was recorded in a church register and reported in a local newspaper. Knowing these two things, it's easy to see that the birth date range suggested by the age in the 1870 census is an outlier that doesn't work well with the parents' probable marriage year. And, the birth dates and date ranges suggested by the 1880 census and the death-related records aren't feasible. I'm quite sure the two children were born to the same mother and it's very unlikely she gave birth to one child five months after another. But, if the exact birth date provided in the obituary is off by a year--the hypothesized date is indicated in blue--then it would be consistent with his age provided by a brother in the proof of heirship document and with his age as recorded in two census records. It would be necessary, of course, to examine specific evidence in detail, in writing, before drawing any conclusions, but the visual makes it easy to see a path that a proof argument might take. I'm curious to know how the rest of you approach this topic. If you can offer further advice for sorting through birth, marriage, and/or death date evidence, please post a comment. Thanks!